Losing photo stored on your Android device can be very distressing. So, here, we will tell you how to backup Android photos to Dropbox so that you can recover your deleted photos. It is not uncommon to lose your photos stored on your Android device due to storage failure, virus, or accidentally deleting photos which you didn’t intend to or losing your smartphone. So, it is recommended to keep a backup of these photos. You can either backup Android photos to your computer or cloud storage. But backing up them on cloud storage will allow you to access your photos from anywhere. Dropbox is among the top cloud storage services that are available for Android users to backup Android photos. How to backup Android photos to Dropbox is one of the most asked questions on the internet. So, in this post, we will tell you the best methods to backup Android photos to Dropbox. It is very easy to backup Android photos to Dropbox. The process is extremely simple if you have the Dropbox app on your Android device. Even if you don’t have the Dropbox, you can download it for free from the Google Play Store and then backup Android photos to Dropbox. Below we have explained two solutions: manually or automatically backup the photos with Dropbox app. 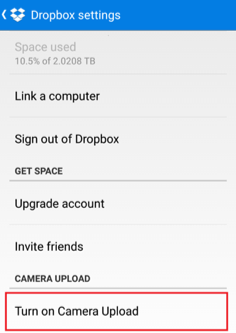 You need to have the Dropbox app on your Android device to backup Android photos to Dropbox manually. You can manually select which photos you want to upload to Dropbox to make a selective backup. To backup Android photos to Dropbox manually, follow the below steps. Step 1 Download and install the Dropbox app on your Android device and then tap on its icon to launch the app. Step 2 Sign in to your Dropbox account using your username and password. If you don’t have a Dropbox account, sign up for one. Step 3 Then click on floating “+” sign and then select “Upload photos and videos”. Step 4 Now, select which photos on your device you want to backup and then click “Upload” button. The photos will be backed up to Dropbox. If you want to backup all of your Android device photos to Dropbox, then it is also possible through the Dropbox Android app. Follow the below steps to learn how to backup Android photos to Dropbox automatically. Step 1 Launch the Dropbox app by tapping on its icon in the App Drawer. Step 2 Tap on the Menu button at the top right and then tap on Settings on the menu. Step 3 In Settings, go to “Camera Uploads” section and then tap “Turn on Camera Upload” option. After turning on camera uploads, you can change settings for it. 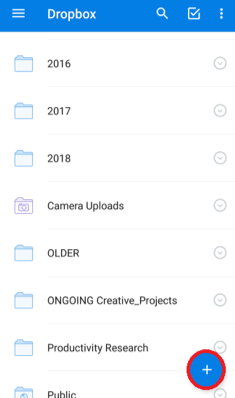 · Tap on “What to Upload” to select if you want to backup both photos and videos to Dropbox or just photos. · “How to upload” option will let you choose whether to use Wi-Fi, or Data and Wi-Fi both to backup photos to Dropbox. · “When to upload” option allow you to determine if the photos should be backed up while your device is charging or when it has a significant amount of battery. It is very important to backup your Android device photos regularly if you don’t want to lose them in case some mishap happens. Since Dropbox is one of the most used cloud storage services, so, here we have explained how to backup Android photos to Dropbox.